Showing results for tags '2019 silverado'. Get a Service Steering Column Lock screen pulling up on new 2019 LTZ Crew cab with a 5.3. Only have 1100 miles on it. Anyone else had this problem and if so what was the fix? HOT LAP - Ride Inside The 2019 Daytona 500 Silverado Pace Truck! Zane Merva Executive Editor / Publisher, GM-Trucks.com February 18th, 2019 The Daytona 500 is the original great american race. The history, the track, the location, the excitement. Daytona is where NASCAR began and auto racing was changed forever. But this past weekend the 2019 Silverado changed the idea that the "pace car" has to be a car forever too. In 2019 the Silverado was the first truck to ever to pace the Daytona 500. Early Sunday morning, right before the big race, we had a chance for a ride in that pace truck around the 2.5 mile tri-oval Daytona track and recorded every second of the experience. Sit back and enjoy! Hey everyone. So, i'm not usually one to beg... but today I am. @Josh and I are going full in to produce a LOT more videos for you. 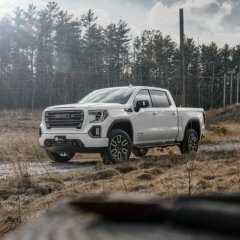 We're dusting off the offical GM-Trucks.com YouTube Channel and the product installs / reviews have already started behind the scenes in our all new garage. Our recent video on the 2019 GMC Sierra's MultiPro Tailgate has over 30,000 views in just a few days. Our first problem is that YouTube is limiting our ability to get a custom URL unless we have 100 channel subscribers. Our second problem is that we need 1,000 subscribers to be able to monetize our channel. Only you can help us with these two problems. Could I kindly ask that you open up our YouTube Channel and hit the subscribe button, please? A quick subscribe will allow us to continue on our way to bringing you more quality videos that are interesting to watch. This now concludes the shameless begging I'll subject you to for now. THANK YOU!